A 58-year-old Detroit man out walking his dog early Sunday was stunned when the man who stopped to pet his dog ended up taking off its collar and stealing the animal. Detroit Police are now searching for the suspect and a woman who was with him that threatened to assault the dog owner. DETROIT (WXYZ) — A 58-year-old Detroit man out walking his dog early Sunday was stunned when the man who stopped to pet his dog ended up taking off its collar and stealing the animal. Detroit Police are now searching for the suspect and a woman who was with him that threatened to assault the dog owner. "The thought that anyone would do something so heartless is just heartbreaking," said Kristina Rinaldi, Executive Director of Detroit Dog Rescue (DDR). Rinaldi said DDR is now offering a $2,500 reward for information that leads to the people police say stole the man's dog. "Sometimes a little incentive gets people to speak up," she says. The dog was stolen Sunday at 3:52 am outside the Citgo gas station on Van Dyke at 7 Mile on Detroit's east side. The male suspect is described as a black man with a thin build. He was wearing glasses, an army green ball cap, a dark colored hooded sweatshirt with white strings, and blue jeans with paint splatter. The female suspect is said to have a medium build, and she was wearing a dark colored jacket with white stripes down the sleeves and brown boots. The vehicle they were in is a 2000 blue Ford Explorer with a Michigan plate of DRV4782. Police said the plate comes back to someone who is dead. There is also a dent on the rear bumper under the license plate. 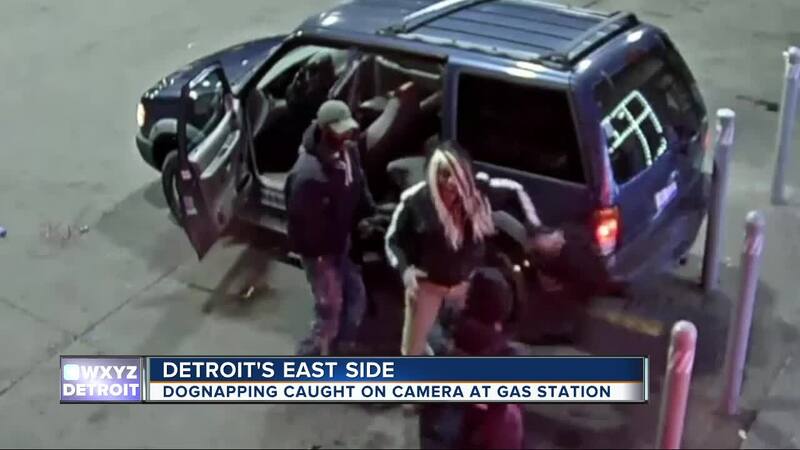 If anyone recognizes these suspects or knows of their whereabouts, they are asked to contact Detroit Police Department at 313-596-1140, or Crime Stoppers at 1-800- SPEAK-UP where you can remain 100% anonymous.